The NBA completely revamped itself for the 2017-18 season. Teams embarked on the 82-game regular season earlier than usual, beginning in mid-October. The All-Star Game was remodeled in the image of a playground pickup game, and for the first time in years, the Conference Finals both went to Game 7s. Still, the league has yet to hit its stride. For some NBA fans the off-season proves the most entertainment one could ask for. The record salary cap increase in 2016 made players wealthier than ever while encouraging noncommittal, one-and-one deals to keep their options open. 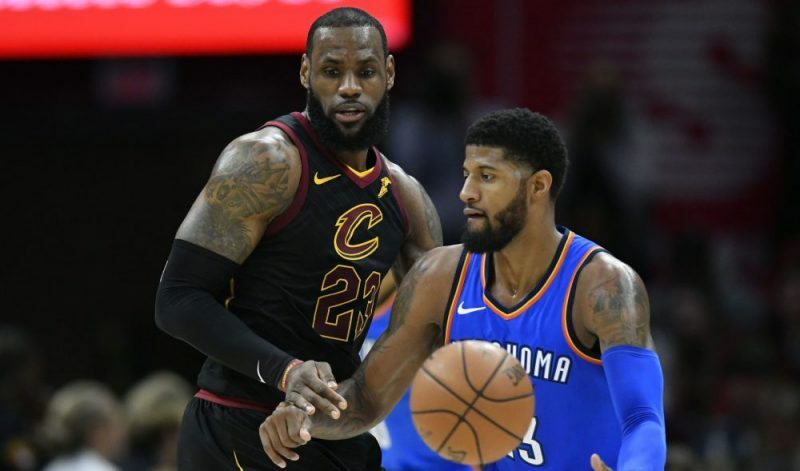 And while the 2018-19 off-season is more stagnant than years past, with many of the highest paid players locked into long-term deals from the payday two years prior, the NBA is sure to drum up some breaking news, as superstars and role players make the next decision on where to spend the foreseeable future. In this page you can check back often to see where some the league’s best, listed below, will land once free agency starts on July 1st. Durant, a two-time league MVP leads the pack in free agency this summer. Arguably no other player has as astronomic of an impact on the NBA playoff outlook as Durant. Golden State Warriors general manager Bob Myers has a championship state of mind and is reportedly willing to make whatever offer is necessary to keep Durant in the Bay Area. The most lethal scorer on the most accomplished team currently in the NBA, Durant has the power to set the destination for the next Larry O’Brien trophy with the flick of a pen. The player who can campaign for remodeling the entire NBA, however, is a 33-year-old kid from Akron. James defied the odds this season with a subpar (at least compared to past seasons) Cleveland Cavaliers squad, reaching the NBA Finals for eight consecutive seasons. Continuing the streak is most achievable in the Eastern Conference, which trembles at James’ every step. At this juncture of his career, James is no longer listening to thoroughly conceived marketing pitches about where to play. He’s made his goals increasingly clear: win rings and take care of his family. Everything else is ancillary. With linkages to Los Angeles (multiple homes, Blaze Pizza and other businesses), Houston (Chris Paul, one-fourth of the “banana boat) and of course Cleveland, any move James makes will put the league on notice, as role players will surely try and support his ninth NBA Finals run. An ACL injury came at the worst time for DeMarcus Cousins both personally and with regards to his team. The New Orleans Pelicans went on a tear without Cousins, entering the playoffs and sweeping the Portland Trail Blazers to reach the second round. Personally, Cousins injury came in a contract season, potentially plummeting his value following a roster experiment that ran counter to the NBA’s notion of small ball. A short-term deal for Cousins is the safest bet for teams with less financial wiggle room, while the man himself is likely intrigued more by winning squads, considering his history in Sacramento. In 2016-17 Wade followed the money. Until the clock strikes July 1, 2018, he’ll be cashing checks from the Chicago Bulls, as part of the terms of his buyout that allowed him to sign with the Cleveland Cavaliers. Wade’s return to free agency requires the least amount of speculation: if he returns for his 16th season, he’ll play for Miami. Thomas is just one season removed from NBA MVP considerations. His laps with the Cavaliers and Los Angeles Lakers were opportunities to continue the legacy he was building in Boston, but each stint sent his NBA future further into retrograde. Facing down free agency this summer is a heavy burden. If he’s willing to play a secondary role and is at full health, teams like Portland or the Minnesota Timberwolves could use his crafty scoring. But given his battle with injury and struggle to reach 100 percent, teams with plenty of cap space will be reluctant to hand him the keys. An ill-timed hamstring injury was the sole barrier to Paul’s first ever NBA Finals. Playing with James Harden in coach Mike D’Antoni’s offense flipped the script on Paul’s career, rebirthing the narrative that he is an all-time NBA point guard. Signing with the Rockets makes the most sense, especially if he can recruit James, but if the Warriors keep getting better (as they usually do) Chris Paul still has the hardest road ahead. Trevor Ariza is playing the field this off-season. After the Houston Rockets fell to the Golden State Warriors, the forward hoped to lock down the last big deal of his career, in the range of $50-60 million over four years. He later made the distinction that he was willing to take a pay cut to win another title. Ariza’s safest bet this off-season is to sign in Golden State – the Warriors thrive on 3-and-D wings and Ariza fits the bill. The NBA made clear this season that mental health is of utmost importance. Kevin Love and DeMar DeRozan stood as the league’s spokesmen on the topic though they weren’t the only ones afflicted. Rose played just 25 games this season with Cleveland and Minnesota, taking time away from the Cavs to reassess his desire to compete. When he returned to the Timberwolves, Rose averaged 14 points off the bench in the playoffs, signaling a step towards a career beyond the 2017-18 season. If Rose has the will to play, rebuilding with the Orlando Magic might be a good fit. Orlando has a dearth of point guard talent, and as one of the NBA’s foremost assist men, Rose could help spur the development of rookie and sophomore Mohamed Bamba and Jonathan Isaac respectively. What’s the best “will he, won’t he” story in sports right now? Arguably, George’s flirtation with moving to Los Angeles has the league in the waiting room – the Lakers have the room to sign a pair of max contract players and getting George plus-one could instantly flip them into a contender. The Thunder, with Carmelo Anthony opting into the final year of his deal, will likely pitch George to bring back the same big three they ran last year, though an upgrade is needed to push deeper into the playoffs. Considering George has all but confirmed he’s playing in Los Angeles at some point in his career it’s only a matter of time before he takes the caravan out west. Since February 24, the Memphis Grizzlies decided to bet against making Tyreke Evans part of their long-term future. For 52 games through the 2017-18 season, Evans sparked a career resuscitation after getting bounced from the New Orleans Pelicans and Sacramento Kings the season prior. Averaging 19.4 points per game in the Western Conference is no easy feat, doubly so on a bottom of the barrel Grizzly team. The Indiana Pacers are making the most noise in the Evans sweepstakes, though most teams could make do with another reliable scorer. At 36-years-old, this season could be Johnson’s last meaningful hurrah in the NBA. He latched onto the Rockets’ championship dreams last year and might do well to stay put. Iso-Joe has a trophy case of individual accolades, though he’s fallen short of attaining the association’s highest team honor. For a minimum salary, Johnson is still a relatively safe bet, though team hopping has done a number on his 3-point percentage, down to 27.6 on the year. Few things create more symbiosis than Tony Parker and the San Antonio Spurs. Parker’s last season was his worst by far if only for the slow start ignited by a quadriceps injury. If the French national plans on returning to the league next season, it’s down home in Texas, hopefully serving as the glue board that holds the wavering Spurs in place. Believe it or not, Rudy Gay is only 31 years old. Playing with NBA artifacts like Pau Gasol and Manu Ginobili might have made Gay’s game appear to age, but realistically he’s just one year removed from an 18 points per game season in Sacramento. Testing free agency when quality wings are prized is a financially sound decision, especially considering his freshly inked shoe deal with Puma. As an added bonus Gay may not have to travel far, as the looming Kawhi Leonard decision might open up a starting spot for the 12-year veteran in San Antonio. When centers began to phase out of style with the rise of small ball, what did Brook Lopez do? He added the 3-ball. Granted, Lopez occasionally has a stretch of games through which he fires blanks, but the threat of an outside game adds versatility where similarly statured players can’t compare. If he wasn’t enticing enough, Lopez also played for the Lakers last year who played at the third fastest pace in the association last year. A producer of solid outlet passes, Lopez is attuned to the modern NBA landscape, even if his height chart says otherwise. Considering most NBA players don’t play into their forties, for a 38-year-old to bet on himself in free agency is a bold move. Crawford, whose face and game exudes the brightness of his younger self, has the ability to agitate onlookers with his proclivity for late shot clock heaves, but his sheer experience should outweigh any doubts of signing him. Favors is an unrestricted free agent for the first time in his seven-year career, and that should be terrifying. He performed well in the playoffs, particularly by pounding his way to the rim against the Thunder, and his new, slimmer fit improves his defensive ability in a switch-happy league. On paper Favors’ scoring has taken a decline since 2015-16, but that’s a consequence of taking smarter shots. Decreasing his attempted field goals per game by four since 2015-16, Favors has improved his field goal percentage by playing into exactly what makes him valuable: a similar bully ball skill set that’s made Zach Randolph a fan-favorite. Moonlighting as an electrifying basketball player must take a toll on Jeff Green. He pops up with a monstrous 27-point game one night, only to flitter away on 2-for-4 from the field the next. Playing sidekick to LeBron James and Kevin Love for a year is a good resume booster but expecting too much from Green is likely to breed disappointment. Brad Stevens impact as a coach, even if it wasn’t recognized at the NBA Awards, rarely goes unnoticed. He regularly finds the best fits for his roster, nearly having built a title team around an injured Isaiah Thomas in 2016. Stevens did the same for Avery Bradley, at one point raising his reputation to that of one of the NBA’s preeminent perimeter defenders. Currently, in between a rough patch with the Detroit Pistons and Los Angeles Clippers, Bradley’s next contract can redefine his utility, though whether that will be as a 3-and-D shooting guard is up for interpretation. Belinelli arrived in Philadelphia on Valentine’s Day, 2018, and immediately made fans swoon, posting a 17 point night on 60 percent from 3 against Eastern Conference rival the Miami Heat. At the time Belinelli fit snugly in the Sixers updated “process” for 2018: add proven veterans to solidify a breakout season. Like temporary teammates Ersan Ilyasova and JJ Redick, Belinelli should have no trouble finding a team that prioritizes 3-point shooting (that’s everyone, except maybe, Tom Thibodeau). With his Eastern Conference splash brother Belinelli, Redick garnered immense praise this season on and off the court. He launched a podcast as part of The Ringer’s network while earning a cool $23 million as the Sixers’ highest paid player. Currently, on the hunt for a multi-year deal in the $18-20 million range, Redick’s season in Philly will have him flush with offers, but whether he gets the deal he wants is another story. DeAndre Jordan is from Houston, Texas. The Dallas Mavericks play in Dallas, Texas. If history had worked as planned, Jordan would already be playing in Texas, well ahead of the unraveling that dissected the Los Angeles Clippers’ big three. Instead, Jordan is tussling with whether to opt into the final year of his current contract. The Clippers have expressed the possibility of trading him if he does so, but the team has already jeopardized his hopes of a fresh start once before.